One way to know for sure that you have the Emerald Ash Borer is if you see the bright green adult EABs, about ½ inch in size, feeding on ash tree leaves. 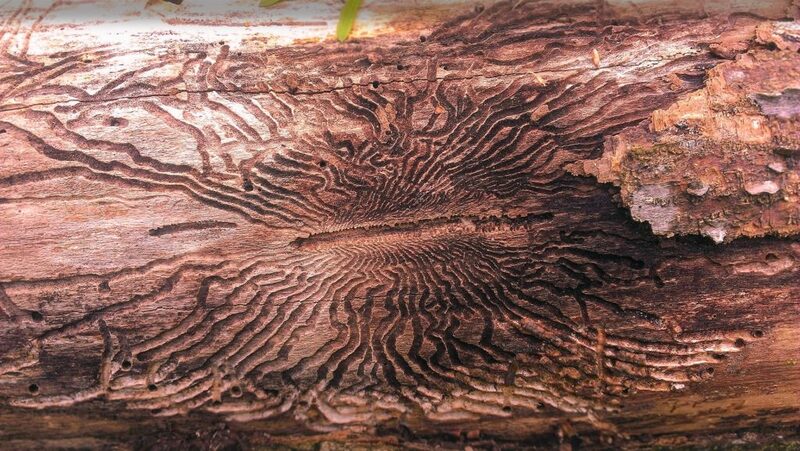 What you typically can’t see are the larvae – these creatures live under the bark and do extensive damage. Larvae feed on the water and tree nutrients, thereby starving the tree of what it needs to survive. You may also see changes to the bark like bleaching, holes, bark peeling, and where the bark has fallen off, you may see worm-like maze patterns. You’ll also notice woodpeckers feasting on your trees more often. If our ISA Certified Arborists can detect what’s happening under the ash tree bark early, we may be able to save your trees and prevent future infestations. T & L Tree Service offers a unique EAB solution that other tree service companies do not. Instead of spraying the ground surrounding ash trees with chemicals that can wash away and be a hazard to kids and animals, we take a different approach. We have found a more effective and less environmentally impactful way by directly injecting the affected ash trees with treatments and preventatives. The injections are highly effective – often one treatment is enough – and they last longer than the typical ground spraying options, lasting up to two years per treatment. This procedure works best and is most cost-effective when compared to other options. As an added benefit, our injectable treatments can protect your trees from over 25 different tree pests.